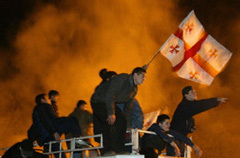 Georgian opposition supporters celebrate after storming the parliament building in Tbilisi, Nov. 23, 2003 (Photo: Sergei Supinsky/AFP-Getty Images). “How good the revolution has been!” Tbilisi’s Akhali Versia enthused on Nov. 30, a week after demonstrators stormed the seat of Georgia’s Parliament and forced President Eduard Shevardnadze to resign. The transition of power was swift and peaceful. Not a drop of blood had been spilled. “Shevardnadze kaput. Good!” shouted one happy protestor after the crowd had taken over Parliament late on Nov. 22. All night long, the horns of cars racing through the center of town echoed him as Georgians waved flags into the early hours of the morning. Shevardnaze had ruled Georgia for 30 years, first as leader of the Georgian Communist Party during the Soviet era, and then as head of state in the independent Georgia. “A revolution of roses” had knocked him from power and ushered in a new era of optimism, the respected daily 24 Saati wrote, referring to the activists who handed out flowers to the protesters during the demonstrations. During Shevardnaze’s time, 24 Saati’s editorial stance was sympathetic to the opposition, especially the trio of Mikheil Saakashvili, Nino Burjanadze, and Zurab Zhvania, the main forces behind Shevardnadze’s ouster. As speaker of the Parliament when Shevardnaze resigned, Burjanadze took over as the country’s interim president. Even newspapers that had been supportive of Shevardnaze cautiously greeted news of his resignation. “It is over,” wrote the previously staunchly pro-Shevardnadze Mtavari Gazeti on Nov. 24, before thanking the opposition, the police, the military, and Shevardnadze for keeping the peace during what it also called a “revolution”. But was it really a revolution? It certainly met with popular approval but everything was so well organized that some people doubt that it could have been a purely spontaneous eruption of popular frustration. So what happened on Nov. 22-23? In the early afternoon of Nov. 22, thousands of protestors, answering a call by Georgia’s leading opposition parties, assembled in the center of Tbilisi to prevent the new Parliament chosen in the Nov. 2 election from convening. The opposition had denounced the elections as “a farce”—an assessment seconded by international observers. The timing of the demonstrations was significant: Had the new legislature convened, Nino Burjanadze would no longer have been speaker of Parliament—or, therefore, Shevardnadze’s interim successor in the case of Shevardnadze’s death or resignation. Thousands of soldiers and police had cordoned off the building to prevent the protesters from disrupting the proceedings. Still, remarkably, Saakashvili managed to enter Parliament with a group of supporters without a fight. Shevardnadze, equally remarkably, was able to escape with his bodyguards because the demonstrators had left one road to the parliament building empty, in contrast to earlier demonstrations. Immediately after Shevardnadze had left, the military and the police disappeared. Then the demonstrators “stormed” the building, or, rather, were allowed to occupy the steps. This was not an unorganized storming of the Bastille. The rank-and-file protestors were kept in line by their own “order troops,” members of Kmara (Enough), an anti-Shevardnadze youth movement with ties to the formal opposition parties and international financier George Soros. Many members of Kmara, and indeed of the opposition parties, learned from another Soros-funded project, Serbia’s Otpor (Resistance) student movement. A documentary on the mass protests that brought Serbian President Slobodan Milosevic from power in September 2000 was aired twice before Nov. 22 by the independent, but pro-opposition, Rustavi-2. Merabishvili didn’t mention the trip that Giga Bokeria, a 31-year-old Tbilisi activist, took to Serbia to meet with Otpor members in February 2003, or the trip to Otpor activists took to Tbilisi last summer. The Otpor activists ran three-day classes teaching more than 1,000 Georgian students how to stage a bloodless revolution. Both trips were funded by Soros’ Open Society Institute. This partly explains why everything went so smoothly—and why at least two banners with the Serbian “Gotov Je” (He’s finished) were to be seen at the Nov. 22 demonstration. Of course, it also helped that the army didn’t defend the president and allowed Saakashvili to enter Parliament. In hindsight, one statement from Nov. 22 seems particularly important: Tedo Japaridze, secretary of the National Security Council under Shevardnadze and the new Georgian foreign minister, publicly told reporters that he no longer supported Shevardnadze. Did the opposition then know that they could count on the army to stand down? More worringly, Aslan Abashidze, the leader of the Autonomous Republic of Ajaria, on the southern Georgian Black Sea coast, quickly denounced the events in Tbilisi as a coup. The leader of the Labor Party, Shalva Natelashvili, did too. The latter, who also claimed that the coup was in fact targeting him instead of Shevardnadze, has already announced that he will boycott the presidential elections the new leadership has scheduled for Jan. 4 and the parliamentary elections scheduled for Jan. 25. Abashidze might do the same. The Ajarian representative in Tbilisi, Hamlet Chipashvili, said that at the moment it’s difficult to comment on the new elections because Abashidze “hasn’t held talks on that with Tbilisi yet.” But Abashidze has already said that “People who came to power by force have no right to give orders to anyone, especially those legally elected.” Overwhelmingly elected, he might well have said. Abashidze has routinely won more than 90 percent of the votes in every election he has faced since coming to power in 1991. In 2002, his 24-year-old son, George, won 94 percent of votes to become mayor of Batumi, the regional capital. Abashidze and Natelashvili are known as ardent opponents of Saakashvili and his clique. In any case, the opposition leaders have managed to get a firm grip on the government by replacing ministers and governors—except in Ajaria and the separatist provinces of Abkhazia and South Ossetia. Most observers believe they will win a resounding victory in the January elections. But judging from conversations with Georgians today, their success will be predicated more on their having ousted the unpopular Shevardnadze than on their own popularity. If Labor and Revival, which both have relatively strong followings, make good their promise to boycott the January elections, Saakashvili and his allies will certainly benefit. The same holds true for the presidential election. It’s a worrying prospect for some. “I hope Saakashvili doesn’t becomes the next president,” one Tbilisi journalist said. “He is mad, just look at his eyes.” Asatiani, the leader of the Traditionalist Party, likewise believes a Saakashvili presidency “would do no good for the country” and that it would lead to further unrest. But Zakareishvili, the political scientist, isn’t worried. “It will probably stay calm in Georgia,” he said, “but much depends on the situation in Ajaria.” He doesn’t believe the southern Black Sea region, whose leadership has already cut all ties with the new authorities in Tbilisi and clamped down on its internal border with Georgia proper, will follow Abkhazia and South Ossetia and secede. The fear is that if a third region of the country secedes, the new government in Tbilisi would lose all credibility. Zakareishvili doesn’t believe this is likely to happen, though. “The Ajarians are Georgians after all. There is no ethnic problem here.” Still, he cautioned, Ajaria could become a problem if Tbilisi provokes it. For the moment, Ajaria doesn’t seem to be in much of mood to stir up trouble. But Georgia’s new leaders still face an uphill battle to keep their popularity, which they owe first of all to Shevardnadze’s ouster, and to reconcile their political opponents with the reality of a post-Shevardnadze Georgia.